Growing a Colonial Herb Garden in your classroom or on the school grounds provides students with a hands-on experience tying history to their everyday lives. As a teacher, you already know that making real-life connections to the concepts being taught enhances understanding and improves retention-but providing quality experiences tying modern life to the life in early America isn't always easy. 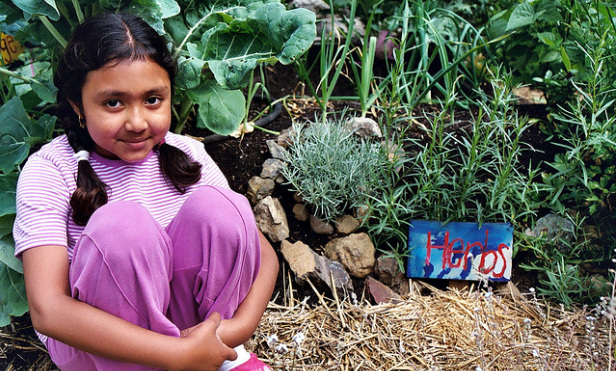 Growing a Colonial Herb Garden engages all the senses and appeals to kids too. Select an area where children can view and care for the garden easily. Inside gardens can be grown in large pots and containers on a southern or western windowsill, but require more care and need tending during vacations and over weekends. Those grown outside thrive with little care other than occasional watering. Consider designing a perennial bed in a permanent location for children to enjoy year after year. Near nature walks or outdoor classrooms make the ideal location, as long as they receive full sun for the majority of the day-but herb gardens can be tucked into small corners of the playground if necessary. Construct a rectangular or square bed out of natural wood. A typical colonial herb garden consisted of a wooden bed 6 to 8 inches high constructed of natural wood, like cedar. Three 8 foot boards are sufficient to construct a 4' by 8' bed and provides plenty of space for a herb garden. If the bed rests along a building with only one of the long sides exposed, it should be no more than 2 feet wide to allow children to reach to the back of the bed with ease. Fill the bed with equal parts garden loam and peat moss, compost or well-rotted manure.. (A 4' by 8' bed holds 16 cubic feet or less than 1 cubic yard) of soil. Water the soil and allow to settle overnight before planting. Add more soil to bring the level to within an inch or two of the rim. Make holes in the soil twice the size of the root ball of the herb seedlings. Plant the seedlings to the original planting depth and firm the soil down around the roots securing the plant in place. Although you can grow herbs from seeds, many are slow to germinate. Seedlings provide immediate results. Fertilizer is not needed for herbs and often inhibits the production of oils responsible for flavor and fragrance. Use sparingly, if at all. Water thoroughly to saturate the soil and keep the soil moist until seedlings show signs of new growth. Reduce water to once or twice a week once seedlings are established. Most herbs thrive in average to dry soil. Raised beds dry quickly-watch for any signs of wilting until you establish a routine that works for your garden. Thyme: Growing to heights of 6 to 10 inches, thyme produces wiry stems with tiny gray-green leaves. Lemon thyme produces delicate yellow and green variegated foliage. Place thyme along the border of the herb garden and allow to trail over the sides. Used both as a seasoning for meats and for medical reasons, thyme occupied nearly every colonial garden. Thought to cure melancholy, flatulence and toothaches thyme was an important addition to the garden. Chives: These easy-to-grow herbs send up slender hollow leaves topped with rich lavender blooms in early spring. Used to season foods, chives provide a mild onion flavor. Chives were thought to protect children from evil spirits. Chives return each year in attractive clumps. Place near the front of the bed. Sage: Sage grows to heights of 8 to 10 inches and produces fuzzy gray-green leaves that add texture to the bed. Colonists fasted on parsley and sage in spring to "spring clean" the body and promote good health. It was cooked with calf brains. Boiled in teas or used a as gargle and added to baths sage was an important colonial herb. It was even thought to cure gray hair. Mint: Mint grows quickly and provides uplifting scents. Colonial use include brewing in tea to comfort the nerves and boiled with fish or added to puddings for flavor. This stimulating herb appeals to children as merely brushing the leaves releases fragrance. Grow mint at the back of the garden bed as some varieties reach heights of 2 feet or more. Nasturtiums: These edible flowers add spice to fresh salads. Bright blooms add life to the herb garden in shades of yellow, orange and red. Pickled flower buds were a substitute for capers. Tall climbing nasturtiums can be grown at the backs of beds or on a wooden trellis. Dwarf varieties trail gracefully over sides of beds. Sweet Basil: Basil grows quickly and produces light green leaves. This annual must be replanted each year, but is worth the effort as it releases pungent sweet fragrance when disturbed and can be used as seasoning to tomato dishes.